Aims and Objectives: The aim is to compare the time taken to perform two endodontic retreatment techniques by three dental interns and endodontist, and in addition, to assess the leftovers of endodontic material left after the treatment by both interns and endodontists. This will help us to make a conclusion based on our research and provide recommendations to increase productivity and efficiency in dental procedures by youngsters. Materials and Methods: A total of 80 extracted noncarious human teeth with straight canal with fully formed apices which were previously obturated were chosen. Teeth were randomly divided into two main groups and then subdivided further into three groups of interns (Group A) and one group of endodontist (Group B). Retreatment was performed using hand files and rotary system with and without chloroform. Radiovisiograph was taken before, and then time was calculated. The remaining gutta-percha or sealer on the root canal wall was visually scored with the aid of an endomicroscope. Results: The mean times obtained (in min) were analyzed using one-way analysis of variance, which revealed no statistically significant difference between the working time utilized for retreatment and the examiners (P < 0.05). Two-way cross-tabulation showed endodontist was more likely to remove the obturating material completely from the root canal than dental interns. Chi-square test showed this association to be statistically significant (P < 0.05). Conclusions: Although there was no statistically significant difference between the working time, all methods left remnants of obturating material on the canal walls which showed significant disparity among Group A and Group B. However among all groups, endodontists removed the remnants completely. The removal of GP using rotary instruments in the retreatment process have decreased the chairside clinical time. Although ProTaper retreatment (ProTaper R) (Dentsply Maillefer, Baillagues, Switzerland) and Hedstrom files (Dentsply Maillefer) have been designed for GP removal, ProTaper R system consist of three flexible instruments (D1 [30/0.09], D2 [25/0.08], and D3 [20/0.07] files) which are especially designed for filling removal from the coronal, middle, and apical portions of root canals, respectively. Hedstrom files sizes 30, 25, and 20 are used in a circumferential quarter-turn push–pull filing motion to remove the root fillings from the middle and apical portions until the original working length (WL) had been reached. Mohammad Hammad, in 2008, found the effectiveness of K-file hand and ProTaper rotary instrumentation in removing GP during retreatment. He concluded that there were GP remnants with both techniques, but K-file system was more efficient in removing GP than the other technique. In 2007, a study was conducted to assess the time of retreatment of canals obturated with different materials. The filling materials were removed and radiographically analyzed. In conclusion, time was not a significant factor in this study. After obtaining the necessary ethical approval from the Institutional Committee of Research, this study was carried on 80 extracted noncarious human teeth with straight single canals and fully formed apices, which were prepared 1 year ago using step back technique. Canal instrumentation was done using K stainless steel files (Thomas, Société FFDM-PNEUMAT, Bourges Cedex, France), with master apical file size #35. Ethylenediaminetetraacetic acid (META BIOMED, MD-ChelCream) was used. Irrigation was done by 2.5% NaOCL (Sodium Hypochlorite) and normal saline. Canals were dried using paper points and obturated with master GP #35 and AH 26 root canal sealing material (Dentsply DeTrey, Konstanz, Germany) by lateral condensation. Radiovisiographs (RVGs) were obtained to assess the teeth and measure the WL from the cusp tip of the crown to the apex, with an average length of 21–24 mm. Teeth were randomly divided into two main groups (A and B), and subdivided further into three groups of dental interns (Dental Intern1, Dental Intern2, and Dental Intern3) under Group A, and one Endodontist under Group B. Each group did a retreatment procedure on 20 teeth; 10 teeth using hand files (five teeth with GP solvent and five without) and the other 10 using rotary system (five with solvent and five without) [Figure 1]. Two to three drops of chloroform GP solvent (Merck, Darmstadt, BRD, Germany) were applied. GP was first removed from the coronal third using Gates-Glidden Drills (MANI) starting with sizes 3 then 2 and 1. Hand instrumentation was then carried out using hedstrom stainless steel hand files (Thomas, Société FFDM-PNEUMAT, Bourges Cedex, France) of sizes 25, 30, 35, and 40 with circumferential push and pull motion to remove the obturation material and sealer from the canal walls. Canals were irrigated with 2.5% NaOCL and normal saline then dried by paper points. Total time of the procedure was calculated for each tooth. Gates-Glidden Drills (MANI), sizes 3, 2, and 1 were first used to remove GP coronary. Then, the same type and sizes of Stainless Steel H files (Thomas, Société FFDM-PNEUMAT, Bourges Cedex, France), were used for hand instrumentation. Canals were irrigated with 2.5% NaOCL and Normal Saline then dried by paper points. Total time of the procedure was calculated for each tooth. Two to three drops of chloroform GP solvent (Merck, Darmstadt, BRD, Germany) were applied. WaveOne rotary system with ProTaper retreatment (D1-D2-D3) rotary files was used with the crown-down technique at torque 600 rpm. Protaper Next (X1, X2, X3, X4, and X5) was used to the full WL for canals longer than 22 mm. Canals were irrigated with 2.5% NaOCL and normal saline then dried by paper points. Total time of the procedure was calculated for each tooth. Same rotary system and files were used with crown-down approach. Canals were irrigated with 2.5% NaOCL and normal saline then dried by paper points. Total time of the procedure was calculated for each tooth. Collected data were entered into the Statistical Package for Social Sciences (SPSS), version 20 (SPSS Inc., Chicago, IL, USA). [Table 1] and [Table 2] show the distribution of the mean ± standard deviation (±SD) working time in minutes (mins) for retreatment and percentage (frequency) of complete removal of the obturation material from the root canal. Overall, the highest mean ± SD working time used was by the dental intern 1 (21.34 ± 5.17 min) and the least was by the dental intern 2 (7.37 ± 4.32 min). [Figure 2] and [Figure 3] show the distribution of mean working time used and success rate of complete removal of the obturation material from the root canal by the system. Dental intern 1 used the highest working time (21.34 ± 5.17 min) and dental intern 2 used the least working time (7.37 ± 4.32 min) with the hand file. Dental intern 1 used the highest working time without chloroform (21.34 ± 5.17 min), and dental intern 3 used the least working time (9.10 min). With chloroform, the highest time was used by an endodontist (17.02 ± 6.31 min) and least time by dental intern 2 (7.37 ± 4.32 min) [Table 1]. With the rotary system, dental intern 3 used the highest working time (15.21 ± 2.08 min) and dental intern 2 used the least working time (7.41 ± 0.01 min). Dental intern 3 used the highest working time without chloroform (15.21 ± 2.08 min) and dental intern 2 used the least working time (7.41 ± 0.01 min). With chloroform, the highest time was used by an endodontist (14.34 ± 2.19 min) and least time by dental intern 1 (12.03 ± 3.54 min) [Table 1]. The mean times obtained (in mins) were analyzed using one-way analysis of variance, which revealed no statistically significant difference between the working time utilized for retreatment and the examiners (P < 0.05). Two-way cross-tabulation showed endodontist was more likely to remove the obturation material completely from the root canal than dental interns. Chi-square test showed this association to be statistically significant (P < 0.05). Although dental intern 2 followed by dental intern 3 used the last time, the overall success rate of the complete removal of the obturation material from the root canal was only 40% each. On the other hand, the success rate of dental intern 1 and endodontist was 50% and 100%, respectively, [Figure 2] and [Figure 3] which expressed that expulsion of scraps of endodontic material was done best by endodontists. Retreatment of the root canal is one of the most complicated and protracted endodontic procedure. It is essential to evacuate the obturation material for the reshaping of the root canal system and for the attainment of the preferred objectives in root canal therapy. The favorable outcome of endodontic retreatment is definitely connected to the absolute elimination of the filling material from the root canal. Numerous researchers have been conducted to develop and explore new implements that endow with clean debris-free and disinfected root canal system. Even though the use of rotary instrumentation is easier and expeditious, effectual cleansing of the complete root canal system is quite a challenge. Various methods have been suggested to remove the obturation material from the root canal, comprising application of heat, ultrasound, manual and rotary instruments, Gates-Glidden burrs, and use of adjunctive solvents. This current study was intended to evaluate the capability of two retreatment protocols to evacuate root filling material from the canal. GP removal using hand files is a monotonous process. Disparate varieties of GP solvents were utilized to ease the evacuation of GP from the root canal system. Among them, xylene and chloroform were the most frequently used solvents., Chloroform has the benefit of dissolving and evaporating rapidly with a vapor pressure of 195 mmHg, and also it permits faster access to the WL and aid in preserving the original path of the canal by encouraging instrumentation within the obturation mass. In previous retreatment studies, residual GP was examined radiographically or estimated using evaluation scales. As radiographs are used to confirm the existence of filling materials on the root canal area, the choice of using a radiographic technique for assessment of the immaculateness of root canal walls was done to simulate clinical procedures. This study evaluated the remaining filling material with the help of the radiographs being analyzed using RVG. However, owing to similar radiopacity of dentin and the thin coating of obturating material, residual debris was not detected completely by radiographs. Hence, to overcome this in this study, endomicroscope (ZEISS) was used after radiographic analysis to visualize the cleansed area of the root canal walls. In the current in vitro study, two different instruments such as one manual and one rotary were used for endodontic retreatment. All the retreated teeth had comparatively straight canals that matched all the samples in the experimental groups. The finding that rotary instruments shortened the time needed to evacuate the obturating material is in compliance with most previously published researches. When mechanized instruments are considered the outcome of our study substantiated this notion. The mean time taken to prepare the root canal using rotary system was less than that with hand files. With the hand file, highest working time (21.34 ± 5.17 min) was observed, whereas in rotary system; working time was minimized to 15.21 ± 2.08 min. It is in agreement with the study of Narender Reddy et al., which showed a similar result to the present study. Another study conducted by Glosson and Haller revealed that using NiTi rotary system the time of retreatment is faster than K-flex files. Retreatment using rotary files with or without the chloroform was quicker than that with hand files with chloroform. Rotary instruments with the use of chloroform required 14.34 ± 2.19 min for complete removal of the old root canal filling. However, without chloroform the procedure took 15.21 ± 2.08 min. The difference observed was not statistically significant (0.87 min). Comparable results were also recorded by, who discovered that ProTaper Universal retreatment files fulfilled the process within 5.7 min, but with the use of chloroform, these instruments proved to be unsuccessful to reduce the working time (8.8 min). It is also in agreement with the research conducted by Kfir et al., where the same conclusion was noticed. However, the literature shows the following studies which contradict the findings of the present study. Hülsmann and Bluhm, who found that due to radial-land and U-shaped transverse section, GT rotary instruments are unable to cut the filling material more efficiently. Other authors also reported that FlexMaster or Hedstroem files have increased cutting efficiency than ProFile and GT rotary file systems. The working time, in this study, indicated that there was no significant statistical difference seen between the groups examined, which is in accordance with the study by Cunha et. al. As shown in the literature, it was unfeasible to evacuate GP or sealer remnants from root canals with any retreatment methods, regardless of manual or mechanized systems. Wilcox et al. (1987) found that regardless of the technique of reinstrumentation debris of GP and sealer were present. Same results were observed by Kfir et al., where neither the ProTaper retreatment files nor the Hedstrom files provided the canals free of obturating material. Undeniably, both techniques left considerable amounts of debris of root filling materials on the canal walls. This was also confirmed in the present study, as none of the samples was debris free. It is postulated that chemically softened GP results in inadvertent distribution and forms a film on the canal surface which can easily be forced into complex canal anatomy that is not reached by the instruments. This emphasizes the challenges of remnants removal and necessitates more time., The challenge here is that in day-to-day clinical practice, even though the operating microscope is extremely useful, the dentist can only adopt the visual and radiographic analysis to assess the complete cleansing of canals following retreatment methods. As recommended, an amalgamation of rotary instruments for the initial fast elimination of GP and hand instruments to complete the cleaning of the root canal particularly in the apical third of the root signifies the enhanced protocol for acquiring clean canal walls throughout endodontic retreatment. Finally, the expulsion of endodontic material from the root canal was thought about between the endodontists and the intern groups which revealed that endodontists expelled the remainders completely after which were intern Group 1, Group 2, and Group 3. This may not have any factual importance, yet clinically it will make the part. This might be due to the experience and abilities learned after some time. Endodontics is an expertise requiring the utilization of fragile instruments inbound spaces. Unavoidably, issues will happen, yet a significant number of these are avoidable giving the administrator practices care and tolerance, which can be mastered by many young dentists. Although all methods left remnants of obturating material on the canal walls, significant disparity had been noted among Group A and Group B. Retreatment with mechanized instruments was quicker when compared to hand files. The use of chloroform in combination with mechanized instruments proved ineffective in decreasing retreatment time and among all groups endodontists removed the remnants completely. Siqueira JF Jr. Aetiology of root canal treatment failure: Why well-treated teeth can fail. Int Endod J 2001;34:1-0. Friedman S, Stabholz A, Tamse A. Endodontic retreatment – Case selection and technique 3. Retreatment techniques. J Endod 1990;16:543-9. Betti LV, Bramante CM. Quantec SC rotary instruments versus hand files for gutta-percha removal in root canal retreatment. Int Endod J 2001;34:514-9. Giuliani V, Cocchetti R, Pagavino G. Efficacy of ProTaper universal retreatment files in removing filling materials during root canal retreatment. J Endod 2008;34:1381-4. Khedmat S, Azari A, Shamshiri AR, Fadae M, Bashizadeh Fakhar H. Efficacy of ProTaper and mtwo retreatment files in removal of gutta-percha and GuttaFlow from root canals. Iran Endod J 2016;11:184-7. Gu LS, Ling JQ, Wei X, Huang XY. Efficacy of ProTaper universal rotary retreatment system for gutta-percha removal from root canals. Int Endod J 2008;41:288-95. Hammad M, Qualtrough A, Silikas N. Three-dimensional evaluation of effectiveness of hand and rotary instrumentation for retreatment of canals filled with different materials. J Endod 2008;34:1370-3. Cunha RS, De Martin AS, Barros PP, da Silva FM, Jacinto RC, Bueno CE, et al. In vitro evaluation of the cleansing working time and analysis of the amount of gutta-percha or resilon remnants in the root canal walls after instrumentation for endodontic retreatment. J Endod 2007;33:1426-8. Fariniuk LF, Westphalen VP, Silva-Neto UX, Carneiro E, Baratto Filho F, Fidel SR, et al. 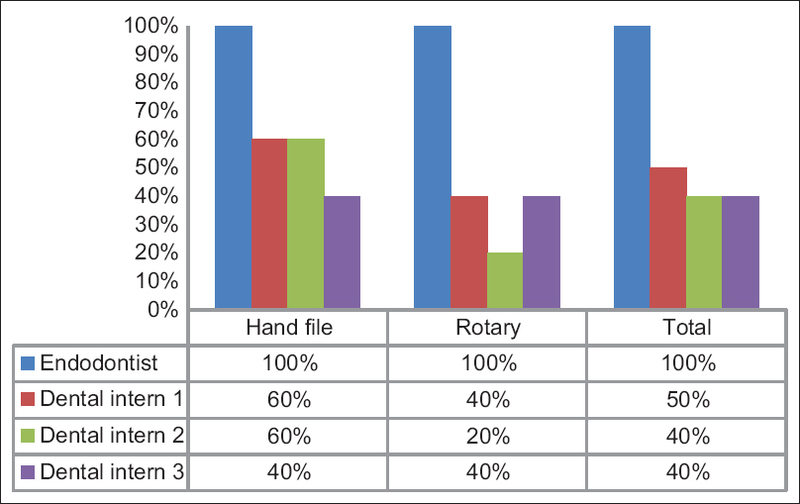 Efficacy of five rotary systems versus manual instrumentation during endodontic retreatment. Braz Dent J 2011;22:294-8. 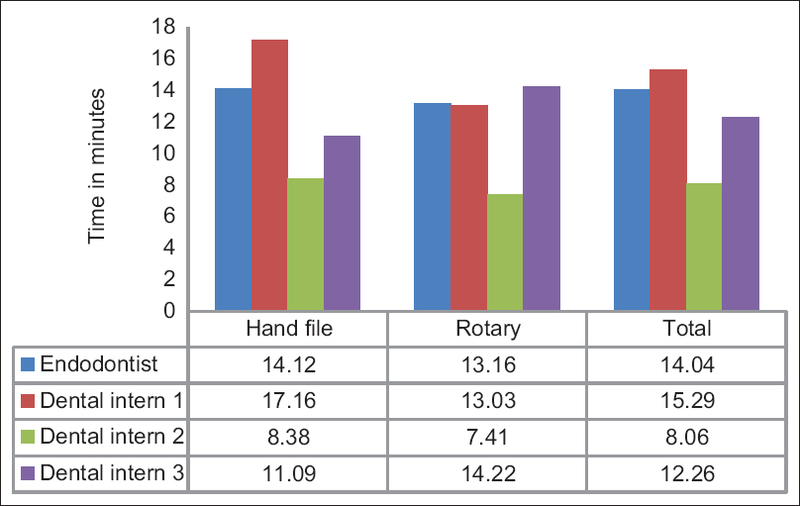 Varri S, Chukka R, Bolla N, Kavuri S, Kumari S. Endodontic retreatment: Rotary versus hand instrumentation: Anin vitro study. J NTR Univ Health Sci 2012;1:116-9. Kumar MS, Sajjan GS, Satish K, Varma KM. A comparative evaluation of the efficacy of proper universal rotary retreatment system for gutta-percha removal with or without a solvent. Contemp Clin Dent 2012;3 Suppl 2:S160-3. de Carvalho Maciel AC, Zaccaro Scelza MF. Efficacy of automated versus hand instrumentation during root canal retreatment: An ex vivo study. Int Endod J 2006;39:779-84. Keshav V, Passi S, Monga P, Mahajan P. Effectiveness of hand and rotary instruments in retreatment of teeth filled with resin-based filling material: Anin vitro study. Endodontology 2016;28:132-6. Reddy N, Admala SR, Dinapadu S, Pasari S, Reddy MP, Rao MS, et al. Comparative analysis of efficacy and cleaning ability of hand and rotary devices for gutta-percha removal in root canal retreatment: An in vitro study. J Contemp Dent Pract 2013;14:635-43. Takahashi CM, Cunha RS, de Martin AS, Fontana CE, Silveira CF, da Silveira Bueno CE, et al. In vitro evaluation of the effectiveness of ProTaper universal rotary retreatment system for gutta-percha removal with or without a solvent. J Endod 2009;35:1580-3. Kfir A, Tsesis I, Yakirevich E, Matalon S, Abramovitz I. The efficacy of five techniques for removing root filling material: Microscopic versus radiographic evaluation. Int Endod J 2012;45:35-41. Carrotte P. Endodontic problems. Br Dent J 2005;198:127-33.